synergistic way to detoxify your body and keep your intestines free to keep your body running optimally. BioActive Carbon Plus and Mimosa Pudica. supplement provides support that improves both your immune system and intestinal tract function. Clove supports intestinal health by aiding in digestion and containing a full range of antibacterial properties. contact the company for a full refund. INTESTINAL DETOX: This organic dietary supplement helps you naturally detox your intestine of unwelcome guests. 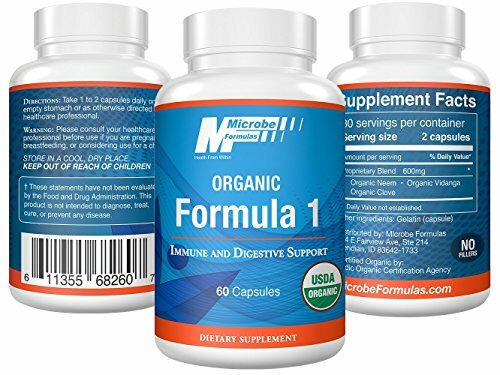 EFFECTIVE 3-HERB COMBINATION: Microbe Formulas' Formula 1 therapeutically combines vidanga, neem, and clove to bring you the intestinal support you need. ORGANIC DIETARY SUPPLEMENT: This formula is certified organic and contains no fillers, additives, or excipients and it's also gluten and GMO-free. COMBINE FOR SYNERGISTIC IMPACT: When you combine Formula 1 with Microbe Formulas' BioActive Carbon Plus and Mimosa Pudica, you get synergistic intestinal performance. 100% SATISFACTION GUARANTEE: With Microbe Formulas' satisfaction guarantee, you can try the product risk free; if you don't like it, contact the company for a full refund. If you have any questions about this product by Microbe Formulas, contact us by completing and submitting the form below. If you are looking for a specif part number, please include it with your message.